38" x 4.5" x 11.5"
The ritual of prayer can be observed throughout the world and can take many forms -- folding hands in quiet meditation, chanting while seated in the lotus position, kneeling and bowing while facing a particular geographic location. People pray for health, happiness, peace and prosperity. Farmers of the Ciwara association pray for the success of the crop through a dance performed at planting time. 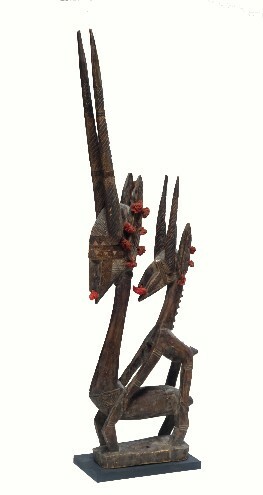 Both male and female antelope figures are seen in the dance. The female figure's mask is identified by the baby on her back. The long horns represent strong, healthy millet. University of Virginia Art Museum, 2002, ob.1979.40.1, 1979.44.14.